Hello! 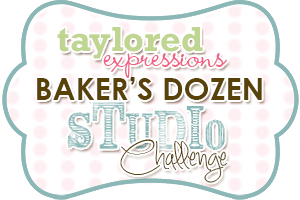 It's time for the Baker's Dozen Studio Challenge. This is a monthly opportunity for the Taylored Expressions team to share what makes our stamping studios hum:) Each month we have a fun, crafty question so we can share our favorites, some tips and tricks, stamping advice and more! What's on your summer reading list? Are you a big reader or not? If you are, what books have you read lately that you would recommend? Do you have a favorite author or genre? How about something for sitting out by the pool, or the beach, or even just the backyard...some nice light summer reading? Do you use fancy bookmarks or do you dog-ear your pages? Or, do you use an e-reader? Everyone can use bookmarks and they make great favors and gifts. Let's see a little inspiration! My sister is a VERY big reader! She gives me some second hand books every Christmas that she thinks I will enjoy, and I almost always do enjoy them! I just finished a book by Jennifer Weiner called Goodnight Nobody, which was really good, and I'm about to start a book called Good in Bed by the same author. LOL...I love that you have a sister that reads a lot too! How VERY clever of you to use the luggage tag to make bookmarks...I think I'll have to give that a try! Hi Kerri! What a sweet and pretty trio of bookmarks! Love the tiny tags on them and your color choices are fab. This is a fun hop today! Kerri, I just LOVE these!! Love those stamps and what a fabulous bookmark set you made with them!! SO beautiful, Kerri! LOVE that you used the luggage tags for this and the little tags are super sweet! 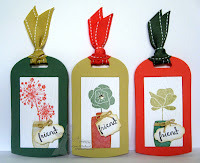 What a great idea to use the luggage tags, Kerri, and I love the flower stamps you used...this are sooo pretty!!!! I am having a lot of fun with this hop. Bookmarks are one of my faves. TFS your idea. Very cute.